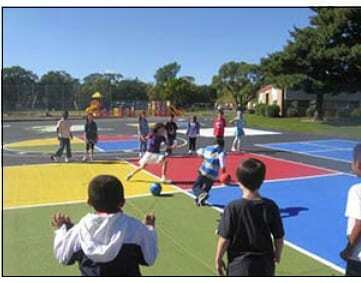 “As a playground supervisor at an elementary school for six years, grade school playgrounds are not for the meek!” says Janis Dingwall, Cedarhurst Elementary School, Seattle. Each year over 200,000 children are injured on school playgrounds. That is 200,000 children sustain injuries serious enough to send them to the doctor or hospital. In 1992, E. Hale Curran Elementary schools (K-5) in Murrieta, Calif., began its own study. The school was three years old with a rapidly growing population. 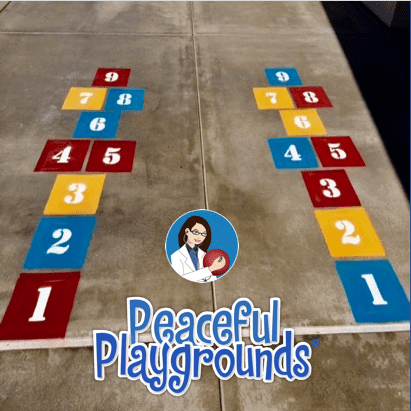 Its playground featured typical courts and games: hopscotch, tetherball, baseball diamonds, volleyball courts, slides, swings and climbing apparatus. As the number of students grew, so did the injuries. In 1992, only 28 percent of the total 32 accidents resulted in visits to the doctor. By 1994, the total injuries had risen to 51, with 43 percent serious enough to warrant a doctor’s attention. In 1995, the Peaceful Playgrounds Program was instituted at E. Hales Curran School. Every institutional aide was trained in the games and their rules. The Murrieta Valley Unified School District’s maintenance crew painted the game markings on the blacktop and fields according to the blueprints. Every child was taught the games, the rules and a method of conflict resolution. A continuous motor skills training program designed to develop coordination and agility enhanced the children’s ability to compete successfully on the playing field. Gerry McGuire, an instructional aide, took the first training, offered in 1995. “Since then I’ve helped teach the program to new employees, students, teachers and staffs on other campuses,” she says. The Peaceful Playgrounds Program consists of five main components. A blueprint for game markings – The first objective of the program is to disperse children evenly across the entire play area (black top and fields). Colorful carefully spaced marking that includes numbers, letters grids, and various geometric shapes delineate play areas. Not only are they attractive kids, they also give the playground a cheerful look of an amusement park. A consistent set of rules – The second objective is to foster consistency and training for children and instructional aides. The rules for each game and piece of equipment are taught, posted and reviewed on a regular basis. Use “Rock, Paper, Scissors” game. Determine who started the conflict. Clarify the details of the incident. Resolution usually comes quickly because students are eager to get back to their games. Having children resolve their own problems free supervisors to do what they do best – look after the safety of all those on the playground. List of equipment required – Game area markings and rule mean nothing without ample and proper equipment. A detailed list of equipment necessary to supply the program through the 10-month school year is provided at the beginning of the year to allow for appropriate budgeting and purchasing. Consistent expectations and training – It is especially important that the Peaceful Playgrounds Program be implemented school wide to ensure success. Each staff member must understand and support the program’s objectives. Being able to play and work cooperatively empowers children and teaches them to work cooperatively in the classroom. Melinda Bossenmeyer, the principal of E. Hale Curran Elementary School in 1994-95, put the Peaceful Playground Program into practice. She trained the entire staff, custom designed the grass and blacktop play areas, wrote rules and instructions, ordered equipment and supervised construction of the playground. By the end of the 1994-95 school year, the school’s enrollment had risen to over 1,200 students, but total injuries had dropped by 50 percent. In 1996-97, the school population dropped since many of the students were moved to a new facility. By 1997-98, the school population had risen to almost equal the 1995-95 school year, yet the injuries were only 17 percent of the 1995-95 totals. What contributed to such a dramatic decrease in injuries? Bossenmeyer attributes the decrease to three things. First, the game markings were laid out so children were distributed evenly across play areas. Since there were no congested areas, there was no unrest due to overcrowding. Second, students were instructed in the proper use of all equipment. For example, records showed that several injuries resulted from the inappropriate use of the monkey bars. Two basic rules made a difference: Hands must be the last thing to leave the bars, and nothing but the chin is ever above the bars. Third, improperly compacted sand falling-surfaces were replaced with wood chips layered to safe depth specifications. “When I came here two years ago as assistant principal, I could see the difference immediately,” says David Koltovich, now principal at E. Hale Curran Elementary. “I saw almost a total involvement in games. No groups of students were loitering about without anything to do.” Although the games were unfamiliar to him, Koltovich soon discovered that they were variations of standard games. Rules were posted on the playground, and all the students knew them. “When kids go out on the playground, they know where they’re going. They have favorite games, and they head right for them. Designed for K-6, the Peaceful Playgrounds Program distributes students evenly throughout the playing area and fields. With colorful markings and plenty of equipment, the objective is to engage the maximum number of students in healthy, often educational, purposeful play. All the aides, including substitutes, wear aprons that hold hall passes, tissues, behavior referrals, bandages, reward tokens, pencils, a pair of rubber gloves and a rule book. Consistency in disciplining or helping children settle disagreements is the aides’ main objective. In order to foster healthy competition, aides plan tournaments at the various game sites. There are different games for different skill level and rules that allow for increased challenging levels of play. Students have choices, but each choice has structure and limits. There are no limits to how many can play each game, but a child will go to a less preferred game rather than wait in a long line for a favorite. Across the nation, in River Vale, New Jersey, physical education teacher Ron Van Buren is using the Peaceful Playgrounds Program at Roberge School. From coast to coast, 8,000 schools are at various stages of implementing the program. It was created to promote peace, cooperation, and education. The dramatic changes in statistics regarding decreased injuries have proved to be an unexpected added bonus. 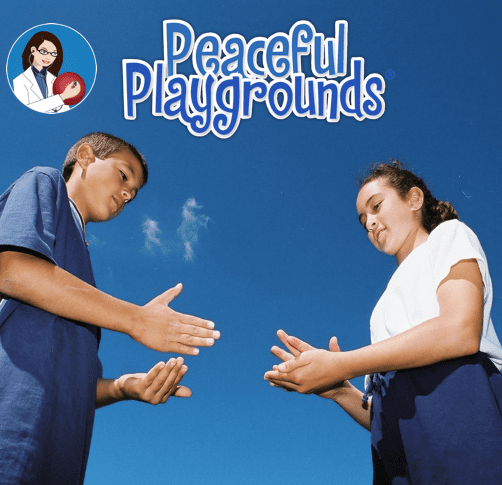 Melinda Bossenmever, Ed.D., program manager for North County Professional Development Federation, is the author of Peaceful Playgrounds. Her web site address is www.peacefulplaygrounds.com. 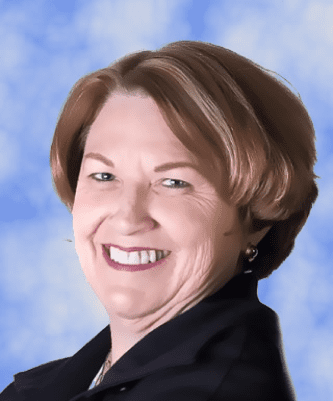 Karen Robertson, MS., instructional support coordinator for Murrieta Valley Unified School District, is the author of Raising Kids Right. The monthly Play Nice! 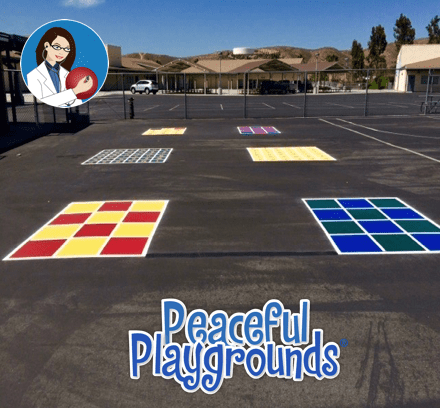 Newsletter is full of tips and techniques for managing a Peaceful Playground. Each month subscribers receive links to valuable resources for free playground grants and updated product information on the award winning playground safety program from Dr. Melinda Bossenmeyer. Add your email address today!